The Andhra Pradesh "Mukhyamantri Yuva Nestam" (Chief Minister's Youth Friendly Scheme) was launched at Hon'ble CM Chandrababu Naidu's "Prajavedika" near his residence in Amravati, AP. Under this 'Unemployment Allowance Pension Scheme,' monthly financial assistance is provided to eligible unemployed youth across the state. 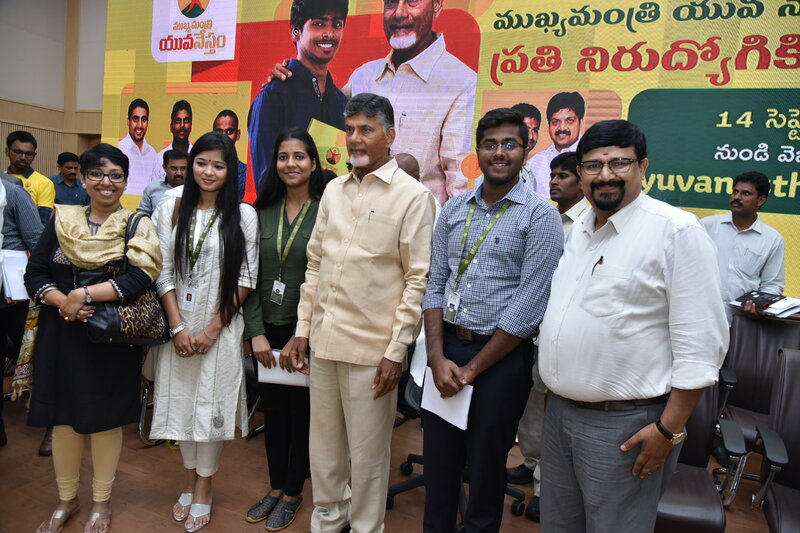 SRM University-AP, Amaravati, Computer Science Engineering students, Kaushik Bhargava and Akansha Chouhan, hosted the event by the Chief Minister and many dignitaries including Mr. Nara Lokesh, Minister for Information Technology, Panchayati Raj, and Rural Development were also present at the launch. The students took over the Master of Ceremonies(MC) duty at the event and ensured a smooth and glitch-free event. Dr. Srabani Basu - HOD - CDC (Career Development Centre), Shweta Paul of Student Affairs and Poolla Ramesh Kumar, Chief Liaison Officer, SRM University – AP, Amaravati coordinated the event and guided the students through the proceedings. SRM University AP, Amaravati has always been a front-runner in the development of the state. In-fact, it was after the Chief Minister announced his plans of building the new capital Amaravati from scratch, that P. Sathyanarayan, President, SRM University, decided to set up a global university at Amaravati. The university today has shaped up well to provide Engineering and Liberal Arts programmes. Mukhyamantri Yuva Nestam is an ambitious project focused on providing assistance to educated unemployed youth for skill development and up-skilling. This will eventually lead to apprenticeships and jobs and shows the commitment of the Government in providing gainful employment to all across the state.